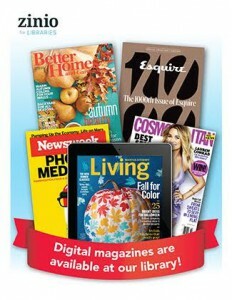 As of January 1, all library cardholders in the Mid-Hudson Library System have access to 94 magazine titles digitally via Zinio Digital Magazines for Libraries from Recorded Books. Checkout a title and read it online on your Internet-enabled desktop computer or mobile device. You can also download the eMagazines to your mobile device to read offline later. There is no need to place a hold on an item nor to return it; simply checkout and keep the eMagazine for as long as you wish! To start exploring, please click here. This entry was posted in News, Services and tagged emagazines, eresource, magazines, periodicals, zinio, zinio for libraries by Emily. Bookmark the permalink.